Our favorite reporter at The Real Deal, Hiten Samtani, just put together this interesting piece blowing the lid off of landlords and their "interpretation" of usable space and how it affects their bottom line. Quoted in the article is our CEO and founder, Michael Mandel. February 01, 2014 By Hiten Samtani The Chetrit Group sold 123 William Street to East End Capital and GreenOak Real Estate for $133 million in October. In January, the new owners signed the Institute for Career Development, a workforce training company, to a 26,558-square-foot lease for the 27-story office building’s entire fifth floor, CompStak’s database shows. Asking rent for the space was $37 per square foot. But the very same space had earlier been listed on the website Office Space for Rent at 23,610 square feet. Sources said the nearly 3,000-square-foot difference, or potential for roughly $110,000 in extra income, can be explained by a phenomenon known as “loss factor,” which allows landlords to charge for space that is shared by all tenants, or space that is dedicated to the building’s common areas, such as the lobby, hallways, elevators and stairwells. Loss factor is defined as the percentage difference between rentable area — the number of square feet that office tenants pay for — and usable area. A building with a rentable area of 400,000 square feet and a usable area of 300,000 square feet, for example, has a loss factor of 25 percent. It’s a quirk that landlords can use to their advantage, allowing them to pass a large part of their costs for the building’s common areas on to tenants. “The rents in the market are a function of loss factor and rental rate,” said SL Green Realty CEO Marc Holliday during a 2012 earnings call. Holliday was explaining to analysts how, despite a drop in Viacom’s rent-per-square-foot at 1515 Broadway, the media company would pay about 2 percent more in total rent, as SL Green had applied a more aggressive loss factor to the space. Viacom would now be paying for 1.39 million rentable square feet rather than 1.27 million rentable square feet. (Viacom’s expansion to 1.6 million square feet was not reflected in the numbers because, while the company had committed to the additional space, it had not yet occupied it.) Industry sources said a high loss factor is just a reality of the New York market. Loss factor “serves a purpose for the landlord, and the tenant needs to understand that,” said Marisa Manley, founder of Commercial Tenant Real Estate Representation, a tenant advisory firm. “Is it an accurate representation of the physical space? Absolutely not.” A building’s rentable square footage typically jumps after it is remeasured, said Keith Keppler, a principal at tenant representation firm Cresa New York. That generally happens after an acquisition, a major capital investment or when an owner is mulling a sale of the property, Keppler said, as that’s when landlords push to extract maximum value out of their properties. “It’s going to continue to be a trend, because it’s part of where the long-term investment [in a building] gets recaptured,” Keppler said. Following an equity investment by the Durst Organization in 1 World Trade Center in late 2010, for example, the rentable area of the still-under construction Lower Manhattan tower leaped to 3 million square feet from 2.6 million square feet. When asked to comment on the change at the time, a Durst spokesperson told TRD that it was “now using the industry standard to calculate the size of the building.” “One World Trade Center is now measured like every other commercial office building in New York City,” the spokesperson added. While loss factor is not exclusive to New York City commercial buildings, it is particularly pronounced here. 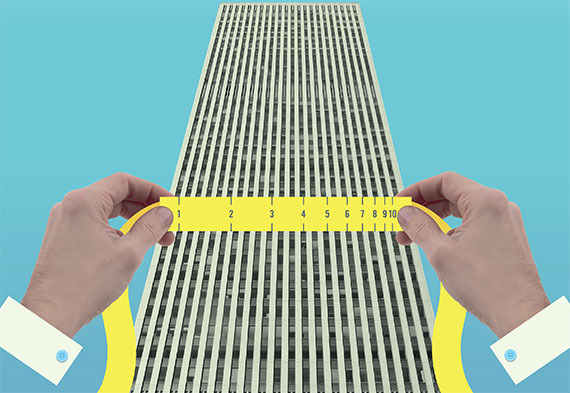 That’s because while most major office markets around the country follow the building measurement guidelines set by the Building Owners and Managers Association, New York follows the Real Estate Board of New York’s guidelines, which allow landlords to more aggressively measure buildings to their advantage. While BOMA calls for a measurement of the interior space to the exterior wall, for example, REBNY guidelines suggest measuring all the way out to the exterior façade of the building, past the window line. REBNY, in a statement to TRD, maintained that the guidelines reflect more than 100 years of office development, including buildings completed before codes were instituted and under earlier building codes. One key result of loss factor is that it can distort the costs for tenants. In terms of asking rents, “New York may not seem that expensive a market,” said Michael Mandel, a former Grubb & Ellis broker who is co-founder of commercial real estate information firm CompStak. “But when you consider that loss factors in New York are significantly higher than the rest of the country,” tenants end up paying a lot more money for the same amount of usable space. Dan Doty, a managing director at developer and property manager Hines, said that loss factors increased in recent years despite buildings becoming a lot more efficient. “It’s based on what the market supports,” he said. Click to enlarge Tale of the tape From 2002 to 2012, 17 out of 50 randomly chosen Midtown Class A and B office buildings reported a size increase greater than 5 percent, according to a study by Commercial Tenant Real Estate Representation. Some had particularly dramatic jumps. For example, without adding any floors, the Blackstone Group’s 1140 Avenue of the Americas saw a 40 percent increase in size in 2010, following a capital improvement project. And shortly after Westbrook Partners bought and renovated 444 Madison Avenue in 2007, the 42-story tower in Midtown East grew by 18 percent. Tishman Speyer’s 3.1 million-square-foot MetLife Building at 200 Park Avenue grew by 275,000 square feet — nearly 10 percent — over the decade, and the CTRR report estimated that at 2012 rental rates, the jump resulted in a $24.3 million increase in annual rental income. Blackstone and Tishman Speyer did not respond to requests for comment. Westbrook declined to comment. REBNY, being a trade organization, has an interest in encouraging generous loss factors, according to CompStak’s Mandel. “What it comes down to,” he said, “is this is a huge profit center for landlords.” Loss factor is something of the Wild West of the commercial real estate business, as there are currently no laws regulating its application, according to Peter Boritz, CEO of Real Data Management, which performs building measurements for most of the city’s major landlords. “A 300,000-square-foot building in Jersey City becomes a 400,000-square-foot building if you airlift it over the river,” Boritz said. “It’s a purely market-driven calculation.” To be sure, most tenant representatives are well-versed in the practice, according to Tom Brady, a commercial broker at Town Residential. “It’s a product that’s become accepted and understood,” he said. In lease negotiations, Brady said, usable square footage is “without question” the focus of the conversation, rather than rentable square footage. “A lot of people get hung up over it,” Mandel said, “but at the end of the day, when every major landlord is doing it, and they’re all kind of doing it within a similar range, it’s become just one more thing that factors into the deal.” Hines’ Doty echoed the thought, saying that although loss factor may seem like a tough concept to stomach for a layman, the practice is so widespread in New York that it’s seldom a topic of conversation in tenant discussions. “I’d rather attract top tenants based on the space we can offer and the facilities we can provide rather than rely on loss factor,” he said. 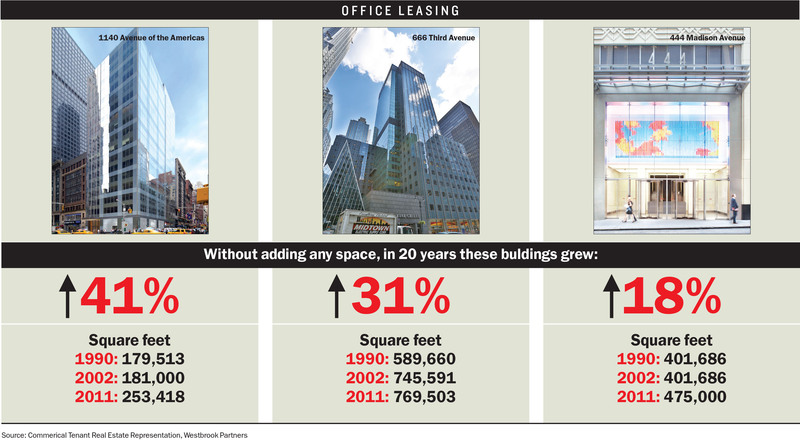 Upward pressure The current loss factor in Manhattan for a single-tenant full-floor space, several sources said, is about 27 percent. That figure jumped considerably between 2006 and 2008, during the real estate boom, but stayed relatively flat since, according to Jorge Acosta Jr., the founder of Measure Up, which measures buildings for clients including Vornado Realty Trust, Brookfield Office Properties, Related Companies and Equity Office. The upward pressure on loss factor, several sources said, was driven by aggressive investment sales brokers, who realized that a higher loss factor could result in a better price for their seller. David Hoffman, a veteran leasing broker with Cassidy Turley, recalled a meeting he attended last year with an owner he represents. “A top investment sales broker suggested increasing the building’s loss factor to 29 percent in preparation for a sale,” he said, “and my jaw dropped.” If a landlord is looking to sell a building on a price-per-square-foot basis, or looking to borrow on a property, a higher loss factor would work to his advantage, Hoffman said. New buyers too, would look to retain or even increase the total square footage of their properties, especially if they paid a premium for the building. Acosta said that if the economy continues to improve, Class A office landlords might be able to nudge their loss factor numbers even higher, akin to what happened in 2006. With Class B and C landlords “jumping on the bandwagon over time,” Acosta predicted a loss factor increase of between 1 and 2 percent over the next two years. But Hoffman suggested that the current investment sales market would not stomach the kind of loss factor leaps seen in 2006, as buyers are savvier and more prudent these days. “The market isn’t as frothy as it was back then,” he said.